This Southern Comfort Southern Breeze is tart and sweet and is a great way to relax at the end of the day while enjoying the garden. Southern Comfort is one of my favorite drinks. I normally have it mixed with diet coke, but I like to use it in cocktail recipes, too. If you add lime and a mix of juices to it, you get a refreshing drink that is perfect for a warm summer evening. Southern Comfort is a whisky basked liqueur made in the USA. It is flavored with fruit and spice and has a sweet finish. The brand was created by a bartender named Martin Wilkes Heron in 1874 in New Orleans. The drink was originally known as Cuffs & Buttons. Making cocktails for friends is easy if you follow a few steps, and a fun way to get a party started in a festive way. 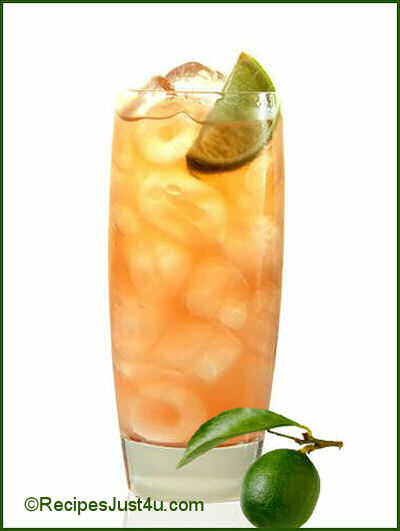 The drink combines both pomegranate and lychee juices to the popular alcoholic drink and the lime adds a nice zest. This gives the drink an Asian flair that is very nice. You don’t even need a cocktail shaker for this drink. Just pour each of the ingredients over ice and give it a swirl and you are ready to enjoy. Pull up a patio chair and relax. It’s summer! Now where is that southern breeze we were talking about? Add the pomegranate and lychee juices.